38: This Is A Crack Outfit. This is the longest time you have ever gone without a letter from me–and there have been some long times. I’ve worried about it a hell of a lot, this is no time to let you go a day longer than necessary without word, but believe me it was necessary. There was nothing I could do–no even warn you that there would be no letters. We were on transports, on maneuvers at sea for the whole of that time and of course no word was allowed out. The same thing will happen soon again–so please don’t worry. I hate this. I have always felt free to tell you all what I thought we were going to do, because I didn’t know. Now I’m pretty certain I know–where we’re going that is, and I do know a lot more of our very specific plans & methods than most. So I have to weigh every word, and don’t like it. One thing though–it will be a very glorious page in Marine Corps annals–something that you will be proud of. This is a crack outfit. They have lavished more care in training the Fourth Division than on any other so far–we’re good and will soon prove it. I wish I could tell you more about this training that we’ve been going through, but–enough of all that. It’s been rugged, and I’m still slowly putting on weight. Got a new man in the platoon about three weeks ago–Stephen Peter Hopkins–Harry Hopkins’ son–a very nice, intelligent kid of 18. He isn’t as mature as the rest of them are, but he is very willing, and gets along well–mixes in, and is big and strong enough to take care of his end of a Machine Gun. He’s the first celebrity in the company, and I’m glad to get him–though I’m not sure just why. He has fit right in–no special attention, but none really needed. About a month ago, or over that I guess, we made a landing at–of all places–the Beach Apartments. Right in front of it, too–stormed right up past it and well up toward the center of town. It was the first time I’d seen it since I said goodbye to you there, that night almost six months ago Mother. I’m still having some troubles with the platoon, mostly an occasional man a few hours over leave, but I think that on the whole it’s going a lot better than it was for so long. I worried a lot about that, didn’t like to think of those boys getting fouled up–though the things they did would have little or no bearing on their conduct in battle. Christmas presents arrived–yours and Fred’s & Aunt Kit’s but you know me; I haven’t opened them yet. I want to save a little bit of Christmas spirit–hear a carol or two as I unwrap–might sneak one little present in on Christmas Eve for you, Mother. Getting presents for you all is going to be a terrible problem–I haven’t been on liberty in almost a month–and though I might get a chance to get off in the next couple of days, your presents will be late, for sort of a Rapp Christmas. Got to go now­–from now on I’m going to write, whether I can mail to you or not. It will at least make me feel better, if not you. Probably late November or early December, 1943. 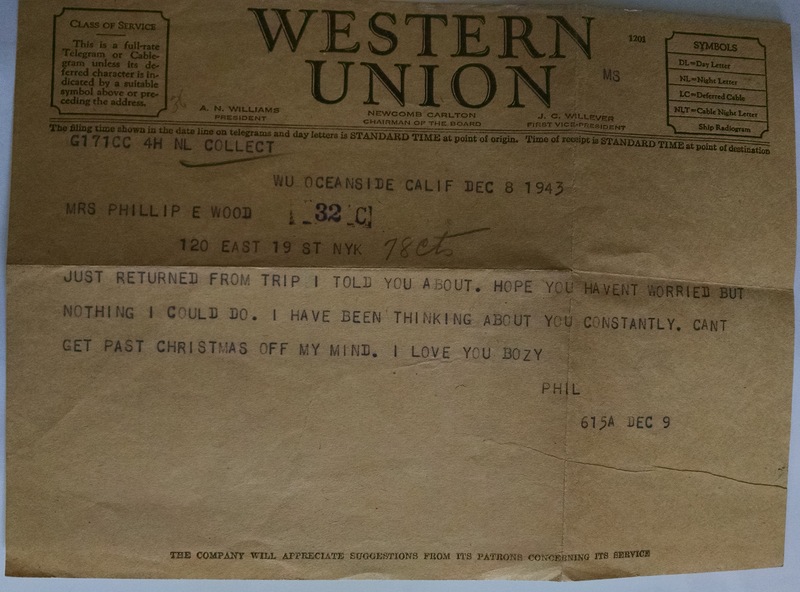 PFC Hopkins, referenced below, joined Phil’s company on 15 November 1943, “about three weeks” before this letter. Harry Hopkins was President Roosevelt’s chief diplomatic advisor; young Hopkins’ return address was The White House, which raised a few eyebrows. Hopkins enrolled at OCS, but after being heckled that his influential father would get him a safe non-combat job, dropped out of the program and enlisted as a private. This point of pride impressed his officers and squadmates, and “Hoppy” quickly became one of the platoon’s most popular men.